By Laura McCallisterA billboard is getting a lot of attention at 19th Street and Baltimore Avenue. 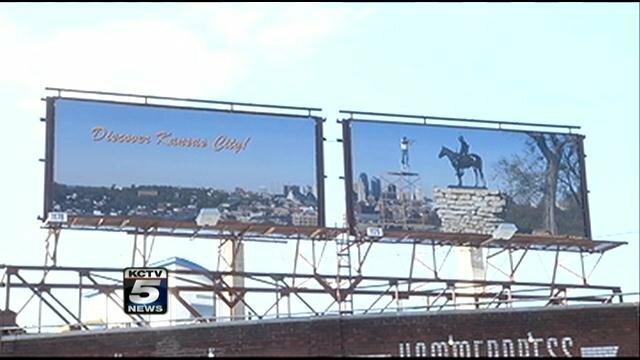 A local artist posted a picture of a man standing on scaffolding and pointing a rifle at Kansas City's famous statue called The Scout. The actual statue is about 10 feet tall, was created by Cyrus E. Dallin and depicts a Sioux Indian on horseback surveying the landscape. It overlooks downtown Kansas City. The Scout (Kansas City, Missouri statue)The Scout is a famous statue by Cyrus E. Dallin in Kansas City, Missouri. It is more than 10 feet tall, and depicts a Sioux Indian on horseback surveying the landscape. The Scout was conceived by Dallin in 1910, and exhibited at the 1915 Panama–Pacific International Exposition in San Francisco, where it won a gold medal. On its way back east, the statue was installed on a temporary basis in Penn Valley Park. The statue proved so popular that $15,000 in nickels and dimes was raised to purchase it through a campaign called "The Kids of Kansas City." The statue was dedicated in 1922 as a permanent memorial to local Indian tribes. 1) Missouri wasn't part of the Sioux's historic range. 2) A Sioux Indian doesn't honor the local tribes because the local tribes aren't Sioux. That's like having a statue of a Norwegian to honor the French. 3) The Indian is half-naked, which he might be in summer, but not in winter. Portraying him this way emphasizes his savagery--how different he is from "us," who wear clothes all the time. 4) The Scout resembles another Indian sculpted by Cyrus Dallin: Massasoit. Indeed, it could be the same Indian. A Sioux scout shouldn't resemble a Wampanoag chief. On to the billboard. The shooting image implies that the Indian is anonymous, an enemy, someone who's less than human and deserves what he gets. Would anyone raise a billboard showing a cowboy shooting a black man? Then why is it considered acceptable to depict shooting an Indian? Answer: Because Indians hold a unique place in our national mythology as "the other." They're our arch-nemesis: the human "wolves" we tamed to "found" America. As with Elmer Fudd or Wile E. Coyote, they exist only to provide sport for us--or so we think. We can imitate, mock, and insult because we consider them cardboard characters from history, not real people.